It looked like an ordinary preholiday gift-wrapping session – lots of adults and kids flourishing bright paper and ribbon while Christmas music played. But Saturday’s event was the first of its kind for the Charlotte nonprofit HopeMatch, which helps the working poor. Families who received help from the charity last year were wrapping presents for new families getting assistance this year. Called “Give Back,” the event at the Ephesus Center, located at the Ephesus Church on South Mint Street, was created especially for those who have already been touched by the organization’s helping hand. Ten families came out to wrap presents, and three families later shared personal stories to a group that included HopeMatch volunteers. A part-time food stamp case manager with the Mecklenburg County Department of Social Services, Blackmore said she works with people who fall between the cracks – not qualifying for assistance because their income is slightly over the limit. Her husband, Brian, is a banker with Wells Fargo; when he got a Christmas bonus five years years ago, the couple wanted to use it to help specific needy families. But they couldn’t find a charitable organization to make that connection. So the Blackmores found families online, or through contacts at work. About a year later, in 2010, Erin Blackmore started HopeMatch, which matches donors with specific families who provide wish lists of up to $100 per person. Blackmore said families are nominated by friends and carefully screened by the nonprofit before they are approved. Christmas gifts are only part of what HopeMatch does. There’s a back-to-school component that provides school supplies to kids. And throughout the year, there are follow-up programs such as a financial planning program for families who need help with budgeting. Last year, HopeMatch helped 52 families with the purchase of such things as clothes, household items and toys. This year’s goal is 80 families. 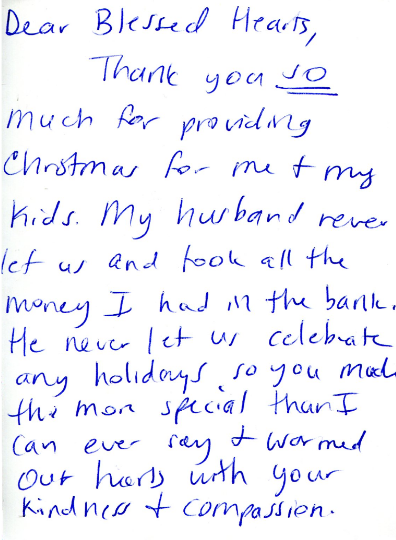 Donors shop for specific families and often receive thank you notes. Among the volunteers at Saturday’s event were Amy Maldonado, a case manager with Mecklenburg County Department of Social Services, her husband, Rady, and their 13-year-old son, R.J.
Vivian and Dan Chaffey of Charlotte came to wrap presents and share the story of how the economic downturn left them struggling to keep a roof over their heads and feed their family. They were living in East Bay, Calif., where Dan Chaffey and his brother ran a custom homebuilding company. Things began coming apart in 2008. The homebuilding business froze, and the Chaffeys lost their own home. About 2 1/2 years ago, they moved to Charlotte. They found jobs here and there, but it was hard to make ends meet. Last Christmas, they found they couldn’t afford to buy presents for their four children. That’s when HopeMatch stepped in. Things are still tight, but better than last year, she said. They participated in Give Back as a show of encouragement to others. Also sharing their story were Steve and Anita Gray of Indian Trail. Last year, he was a stay-at-home dad looking after three children and she was a social services manager on unpaid maternity leave. She’s also a doctoral student in health care administration. At Christmas, the couple felt the financial pinch and couldn’t buy presents for the kids. A HopeMatch donor helped them over the hard times. Later, a volunteer counseled them in budgeting. They’re still struggling, but they do have a little money in savings now. The Grays have referred five families to HopeMatch this year. When Erin Blackmore worked as a Food Stamp Case Manager for the Department of Social Services, she witnessed the struggle of the working poor who were just beyond the income limit to receive government assistance but were trying so hard to make life work. Many became discouraged because they could never catch a break and there didn’t seem to be any help in the community that fit their demographic. Blackmore realized that they were in need of the power of hope because she felt it encouraged people to keep persevering and believing. Inspired, she founded the non-profit HopeMatch in 2010 as a way to serve and strengthen the working poor. The budding organization serves those who are unseen and underserved with assistance to make a lasting difference in their lives. HopeMatch started out providing Christmas gifts for families in need but has organically evolved to include other events such as financial classes, mini room makeovers and personal essentials giveaways. At the annual Swap Shop, families can donate items they don’t need anymore and come back the next day to swap their items for things they do need. The Back to School program matches specific kids’ lists with donors who want to help. 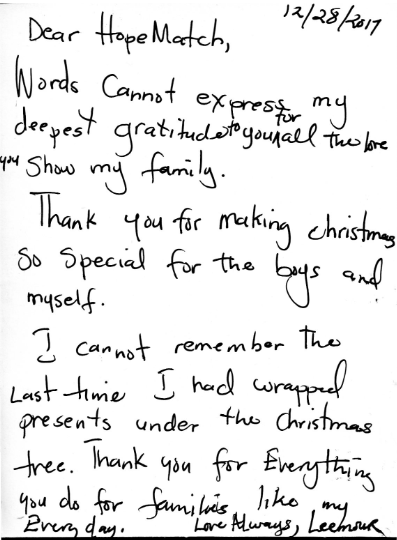 “We believe families do not just need help at Christmas time, but also throughout the year. If we are able to come alongside these families, we can be part of helping them get out of their situation,” Blackmore noted. What sets HopeMatch apart from other local charities is the degree of personalization offered to recipients. Blackmore says her group is not as concerned about numbers as they are about the individual.